After the economic collapse, what comes next? Answer: The grand chess board of World War III! My next set of articles are not for the faint of heart. If you desire to keep on burying your head in the sand, then go watch the NFL Draft. Of course, if we do not collectively wake up the majority of sheep which inhabit this country and motivate them to action against the globalists, the acronym “NFL” will soon come to mean Not For Long. And “Not For Long” will soon represent how long the sheeple of this country can keep their heads buried in the sand as the country disintegrates into total chaos. No amount of cognitive dissonance, normalcy bias and general apathy can protect even the most unaware of Americans as to what lies in their immediate future. The solvency of the Federal Reserve is being threatened and to understand the roots of the coming world war and the roll out of tyrannical martial law, over this issue, I need to take a brief look at the historical underpinnings. A novel system for monetary and exchange rates were established in 1944. The Bretton Woods Agreement was developed at the United Nations Monetary and Financial Conference held in Bretton Woods, New Hampshire, from July 1-22, 1944. This conference established the US dollar as the reserve currency of the world. The Banksters (e.g. Rockefellers’) reveled in their new found fortune. As a result of the Bretton Woods Conference, all nations desiring to purchase Middle East oil had to first purchase dollars and use these dollars to complete the purchase of oil. Nearly everyone inside of our country benefited from this system. Americans basically enjoyed a stable currency minus the inflation rates of about 5% per year which served as an informal tax that went into the Federal Reserve banksters’ pockets. Thus, the Petrodollar was born. If the Petrodollar were to ever be successfully undermined, our currency would sink faster than a submarine with screen doors because there is nothing backing up our money. The old guard at the Federal Reserve worked from 1910 to 1971 to rid the economy of the Gold Standard so that they could enforce debt slavery upon the American people and government through encouraging a prolonged out of control spending spree accompanied by the awarding of lucrative unbid contracts to the elite’s corporations which would dramatically drive up the deficit and line the pockets of the Federal Reserve owners. The coming war with Syria is merely the opening act. The main act, following Syrian subjugation, will consist of the United States and Israel and perhaps England attacking Iran. Iran is the prize needed for the old guard of the Federal Reserve to maintain its strangle hold on the global economy. On the surface, attacking Iran seems like a good idea if it will preserve our economy. However, the risks associated with this course of action are astronomical. The Petrodollar is in real trouble and so is your bank account, your job, your ability to get gas, medicine, food and water. America is literally a push button away from the total calamity that we see in the NBC show, Revolution. In many eyes, the Petrodollar must be maintained at all costs. Syria is the first real domino in the coming conflict that threatens all life on this planet. The take down of Egypt and Libya was mere foreplay. The real action will commence in a few months with the invasion of Syria and the excuse will be to save humanity from Syria’s weapons of mass destruction, namely, chemical weapons. Make no mistake about it, America is headed towards war with Syria and don’t think for a second that this war will imitate, in any way, the wars in Iraq and in Afghanistan. The previous wars compared to Syria, and later with Iran, is child’s play compared to anything we have been involved with in the history of this nation. The “saving the Petrodollar” strategy being pursued by the Federal Reserve is a high stakes gamble with you, your children and the future of humanity being used as their collateral. Proof that the coming war is imminent is evidenced by the accusations being currently made by the US government that Syria is using chemical weapons against the rebels. In this fabrication of the Syrian version of the Boston Marathon bombing false flag event, it is likely that if there are chemical weapons in play, the CIA is the responsible party. Why? Because all roads to Tehran run through Damascus. Iran is the actual target of the Federal Reserve’s war intentions, because Iran is doing the unthinkable as it is waging war on the old guard of the New World Order, by selling its oil to Russia, China and India for gold and this is a dire threat to the solvency of the dollar. Before one can invade Iran, with the threat of Russian intervention looming, Syria must first be occupied and fortified by US/NATO forces. 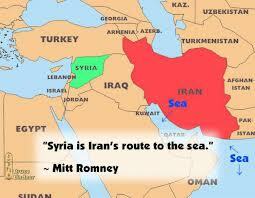 Occupying Syria allows America and her allies to invade Iran from several directions. Through Syria, we will see airstrikes which will fly unimpeded over Northern Iraq. Also, and most importantly, the occupation of Syria will be a threat to the mobilization of forces inside of Russia who would then come under the American long and short range missile batteries, which will be installed in Syria. These missiles will surely be armed with battlefield nuclear warheads. This deterrent could provide the Americans with enough time to occupy most of Iran before Russia or China could act with its conventional forces. This strategy, however, dares the Chinese and Russians to not invoke the use of large scale nuclear weapons in the biggest game of chicken ever played on this planet. 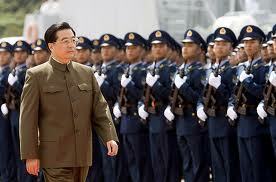 I do not expect China to attack the US in the Middle East, at least not at first. I expect the Chinese to move on Taiwan and let the North Koreans launch its nuclear missiles again st Japan. It is possible that Russia might further invade the US through Alaska. I never thought that elements of the Red Dawn scenario would ever come to fruition, but how many times have we seen the media tell us what is going to transpire in advance of an event? And while we are at it, I would anticipate that China would approach the Southwestern underbelly of the United States via Central America, given that the Chinese control the Panama Canal and are rumored to have troops throughout Central America, including Mexico. And if things really go crazy, all sides may launch its ICBM missiles and their submarine based nuclear missiles at each others homeland and then all bets are off. Perhaps, you now know why I constantly refer these criminal banksters who have hijacked our government as psychopathic. Specifically, why did Iraq have to be invaded? Simple, Saddam Hussein was attempting to sell his oil in currency other than Federal Reserve Notes (i.e. the Euro). He was threatening the Federal Reserve and at that time, he was also a threat to the central bankers in their headquarters, otherwise known as the Bank of International Settlements, which controls all central banking. During that time frame, these banksters would have done anything at that time to prevent a threat to the world’s reserve currency, namely the dollar, which they controlled. Following the completion of the second Iraq war, Exxon and BP controlled 80% of Iraqi oil fields and nobody would be selling Iraqi oil in either the Euro or for gold. However, the game has changed, Iran has replaced Iraq as the major threat to the stability of the Federal Reserve Notes. Iran is economically destroying the US. Unfortunately for every man, woman and child in America, that day of economic reckoning is quickly approaching. China has commenced buying Iranian oil in gold. India has followed suit, as have the Russians. The days of the Petrodollar are numbered and therefore, so is the only source of backing of our dollar. 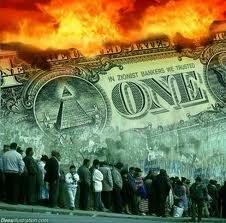 Have you and your family prepared for the collapse of the dollar and ultimately the collapse of society? It is coming and it coming fast. Creating the pretext for fighting a war, and then successfully selling the American public on the need to fight the war, is one thing. However, winning the war, is quite another. How serious are the Chinese and Russians at standing up to the imperialistic United States? Considering that both Chinese President Hu and Major General Zhang Zhaozhong have threatened the United States with nuclear war if they invade Iran, the prudent opinion says that this is the newest version of the “Axis of Evil’s” line in the sand, has been clearly drawn. While all eyes are on Ukraine, the real prize and the key to the solvency of the BRICS is Iran and its willingness to accept gold for oil payments. America is in a very difficult dilemma. If we acquiesce to the Russian and Chinese threat of war for invading Iran, our dollar will collapse. If we attack Iran after taking over Syria, the nuclear powers with formidable armies have promised retaliation. America could see its first invasion on American soil since the War of 1812. It is possible that the Americans will only invade Syria in a game of brinksmanship with the Russians and the Chinese, in order to test their resolve (e.g. a game of military chicken). However, I don’t think that is likely. The Federal Reserve will not back down. They have already killed Gaddafi and Hussein in order to preserve the Petrodollar. They are not going to back down to the Iranians, Chinese and Russians because it will not be their children doing the fighting and dying, it will be our children. Now, does it make sense on why the elite are driving down the price of Gold so they can buy up as much as they can for as cheaply as they can? They intend to be the last men standing at the end of the next great war to end all wars. And just how will the elite sell us on war? You can bet there will be more false flag events, with each one being more horrific than the previous one. And guess who will get the blame? It does not take a rocket scientist to accurately speculate that the last of the false flag events will be nuclear and then all hell will break loose. It is clear, it is hands off Iran or it means WWIII. Does anyone really think that the Federal Reserve is going to take this lying down? Could the path to WWIII be the reason that so many bankers have left the United States because they know what is coming?